This post is about things to do in Varkala. 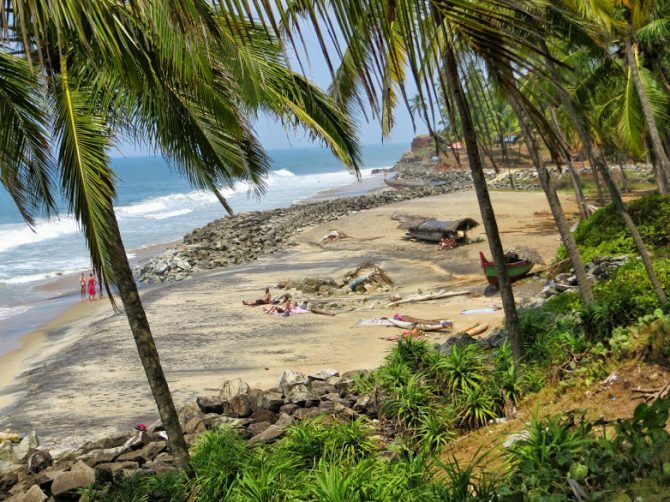 A small beach town in Kerala that sees many backpackers that come for Varkala beach. I wasn’t too impressed by Varkala beach, but I still loved the place for the variety of other things to do in Varkala. Varkala is perched high on a red sandstone cliff overlooking the sea. I thought it would be a good start of my backpacking trip in Kerala. What would be better than planning the rest of my journey in a lovely beach hut with a hammock overlooking the ocean. I couldn’t have thought of a better introduction to South India. Not only was my hammock among the palmtrees an idyllic getaway, but the small town also kept surprising me with interesting experiences. Like many places in India wonderful things simply come on your path. My first night Varkala’s real beauty revealed itself at dusk when the lights of hundreds of fisher boats at the horizon were shining like stars in the sky. The next morning they returned to shore. When I went for a walk to see the sun rise the beach was still empty, except for some yoga practitioners and the fishermen. They were carefully inspecting their nets while showing me their catch of the day. I watched untill my stomach was begging for my usual early morning cup of tea. Chai (tea) is never hard to find in India. On a simple stove on the beach a chai walla (tea seller) was brewing the milky broth with spices. He was already busy serving the line of customers. Men were chatting away while dipping their biscuits in the tea. I too sat down amidst the curious stares of people. Soon I was joined by another woman travelling alone. Together we watched the arrival of pilgrims. Varkala is a very holy place for Indians that come to do the last rites for family members that passed away. Priests were waiting for the families to do their ceremonies for a last farewell right at the beach. It didn’t take long for people to come to us and ask for some pictures. The family’s newest member was put in my arms and despite the baby’s cries they arranged everyone for the perfect family portrait. One family informed us that tonight we should visit the small town of Edava. Every year temples in Kerala try to show off their wealth with a big festival including music, dance and fireworks. The biggest trophies are the elephants. Each temple tries to hire as much elephants as possible to take them on a procession through the village. People told me it would cost 200 euro per day per elephant and to prevent them from going wild there is a special elephant police squad. In Edava everyone was waiting outside with their offerings of flowers and bananas for the elephants who were welcomed like gods in this small town. Time flies when you are having fun. My last day I was in explorer mood and decided to explore Varkala by foot. Strolling on top of the cliff can be a bit tiresome with endless shops and restaurants vying for your attention. The main beach in Varkala is also rather crowded during the day, despite the strong current that makes swimming dangerous. However, as soon as you head north things get more peaceful with quiet secluded palm fringed beaches such as the black beach. At Kappil beach the coast meets Kerala’s famous backwaters. It was my first backwater experience and every time I enjoyed its tranquility and beauty. Varkala has a lot of things to offer. Consider renting a scooter to escape the crowds and explore the small fishing villages in the area. The colourful temples, the great local food and the stunning views on the ocean make it a delight to drive around. Varkala is an important temple town and the most important temple is the Janardhana Swamy temple. Its the first stop for most pilgrims before they do the last ceremonies for their loved ones right at the Papanasham beach. For some off the beaten path places I can recommend the 7 kilometer walk along the sea shore towards Kappil beach where you can do a boat tour through the backwaters. Besides its beautiful secluded beaches, Varkala is also a place to pamper your body and soul. From yoga to meditation and a range of ayurvedic treatments. And don’t miss the excelllent sea food. The cliff is full of hotels and guesthouses ranging from cheap and simple beach huts overlooking the ocean to guest homes and luxurious ayurvedic resorts. I stayed in Bamboo village. A good budget option on the north side of the cliff close to black beach. From Trivandrum there are frequent buses and trains taking less than one hour to Varkala. The train station in Varkala is about 4 kilometers from the cliff area where most hotels and restaurants are. Convenient trains from Trivandrum are the 09:45 AM Netravati express, the 11:15 AM Kerala express or the 11:45 AM Ananthapuri express. You can make reservations in advance, but all of these trains have an unreserved class as well.